Office 365 mainly came up with striking tactics for businesses. It possesses subscription plans for enhanced security, quicker communication, Microsoft cloud storage plus access to productivity app services and much more. This makes Office 365 highly adapted amongst dynamic business verticals. Microsoft unveiled there are more than 60 million monthly active Office 365 commercial customers and the numbers are multiplying with passing span. Approximately 50,000 small business customers are embracing Office 365 each month for enhancement of their business. About 5.4 million user generates events each month within Office 365. Usage of Office 365 is not consistent over various business horizons. Out of fields like Technology, Energy, Financial Services, Food Products, Manufacturing, Media & Entertainment, Healthcare, and Real-estate, Financial services firms have the highest rate of usage. Security and compliance are major benefits of office 365. Within financial services, 39.3% of users actively use OneDrive and 17.3% uses Skype. Healthcare uses 14.2% of Skype, while 12.9% of Manufacturing users rely on Mail platform. 7.1% of Food-product users depends on SharePoint, while Media & Entertainment uses 12.5% of Exchange online. It is found that at present 17.1% of files in One Drive and SharePoint possesses highly sensitive and confidential data. Office 365 offers number of tools and each of them can be utilized for different purposes. Have a look on business benefits achieved from each provided online tool. * Office suite including Excel, PowerPoint, Access, etc. is easily accessible online on any mobile or desktop device. Editing of documents or making a presentation got accessible remotely. * Manage notebooks, pages or sections with OneNote. Its improvised layout possesses column on side of the app which let the readers to efficiently navigate. * 1 TB highly secured cloud based storage – OneDrive for Business to store, share, and sync work files. It is seamlessly integrated with Office Suite/ Applications & SharePoint online and automatically synchronize with desktop files, even offline files. * Scheduling becomes easy and hassles free, as shared Calendars shows when the concerned person is free or busy. Also, personal schedules and meeting can be mentioned for alerts. * SharePoint let one collaborate with teams and allows sharing of files or folders inside and outside an organization. Co-authoring a document, highlighting or commenting on the document, quick search with information of precise digits of viewed and shared insights is also viable with SharePoint and beneficial for SharePoint Developers. * Arrange a meeting or connect with the team remotely with Skype for Business. Have a word (instant messaging), audio or video call or share documents over it. * Yammer, alike any social media tool, where employees can communicate and share information. * Ad-free inbox with 50 GB storage capacity per user, Outlook Mail allows users to send customized and attached files and documents up to 150 MB. Mail accounts can also be named by business name – beneficial for branding. * Easily share training, executive communications in HD quality with Video Portal. Drag and Drop to upload the video. * Attach files of tasks and work concurrently with it with Planner. It also let have conversations around tasks. * Delve allows seeing the documents which are already once accessed. It also manages profile and helps to discover and organize favorite information. * Use Sway to create charming, interactive web-based reports, presentations, newsletters and much more from phone, desktop or browser. * Create logical flow amongst web and apps with the help of Flow. Develop mobile applications with Power Apps. * Security and Compliance is used for providing cutting-edge security and proactive monitoring. 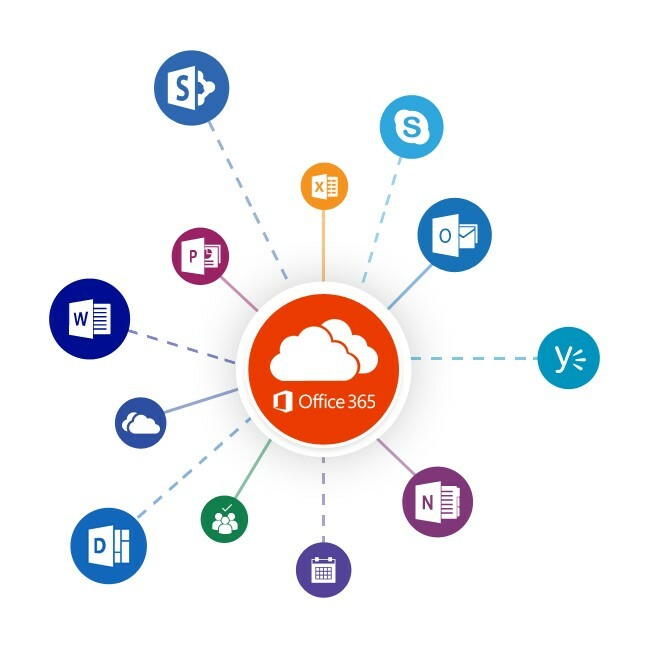 Irrespective of the business sector, Office 365 provides comprehensive privileges where a solution is accessible anywhere from any device, high security, privacy and compliance along with the attractive look and cutting the cost for maintenance and hardware. Also, users need to pay for only those services, they are utilizing. Users need not to learn any advanced IT knowledge and can efficiently access interface and functionalities. Office 365 guarantees 99.9% availability and the solution is automatically upgraded. No on premise updating or patching is required.